The late enrollment penalty is an amount that's added to your Part D premium. You may owe a late enrollment penalty if at any time after your Initial Enrollment Period is over, there's a period of 63 or more days in a row when you don't have Part D or other creditable prescription drug coverage. You'll generally have to pay the penalty for as long as you have Part D coverage. Join a Medicare drug plan when you're first eligible- Even if you don't take many prescriptions now, you should consider joining a Medicare drug plan to avoid a penalty. You may be able to find a plan that meets your needs with little to no monthly premiums. Don't go 63 days or more in a row without a Medicare drug plan or other creditable coverage- Creditable prescription drug coverage could include drug coverage from a current or former employee or union, TRICARE, Indian Health Service, the Department of Veterans Affairs, or health coverage. Your plan must tell you each year if your drug coverage is creditable coverage. This information may be sent to you in a letter, benefit handbook, or included in a newsletter from the plan. Keep this information, because you may need if it you join a Medicare drug plan later. Tell your plan about any drug coverage you had if they ask about it- When you join a Medicare drug plan, and the plan believes you went at least 63 days in a row without other creditable drug coverage, the plan will send a letter. The letter will include a form asking about any drug coverage you had. Complete the form, and return it in your drug plan by the date listed on the from. If you don't tell the plan about your creditable drug coverage, you may have to pay a penalty for as long as you have Part D coverage. How much does the penalty cost? This depends on how long you went without creditable prescription drug coverage. 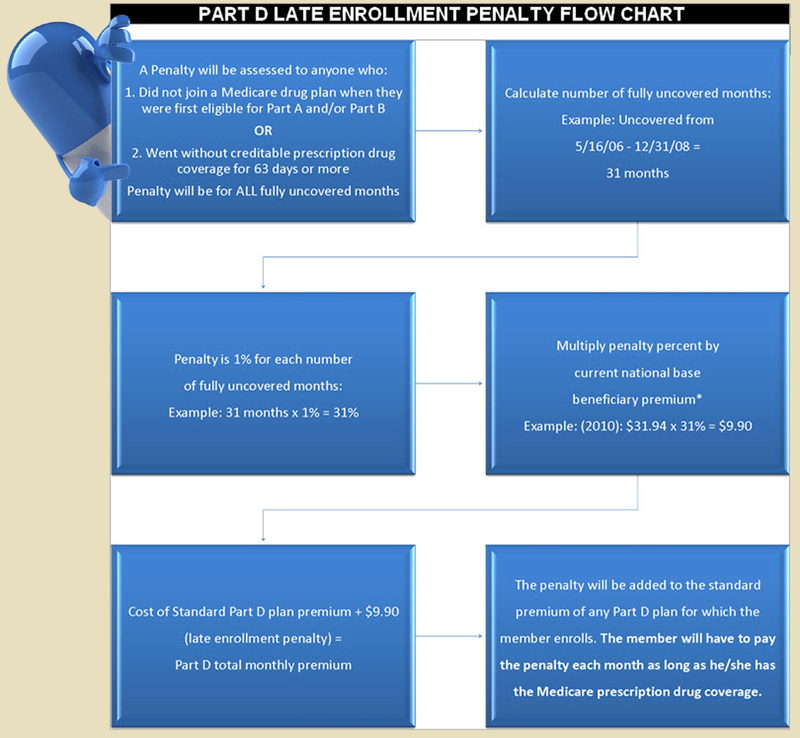 Currently, the late enrollment penalty is calculated by multiplying 1% of the "national base beneficiary premium" by the number of full, uncovered months that you were eligible but didn't join a Medicare drug plan and went without creditable prescription drug coverage. The final amount is rounded to the nearest $.10 and added to your monthly premium. This penalty amount may increase each year if the national base beneficiary premium increases. In most cases, you have to pay this penalty for as long as you have a Medicare Drug plan, even if you switch plans.